I’ve been meal planning for several years. 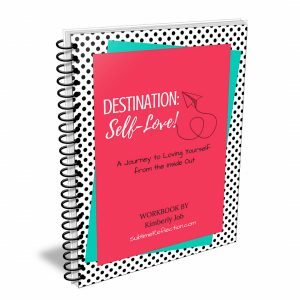 It’s one of the biggest factors in my success losing over 70 pounds. When I have a plan to follow, I always have healthy ingredients in the house which keeps my healthy eating on track. 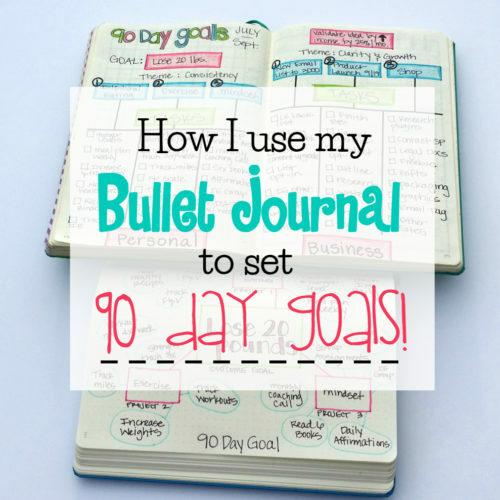 Since I started using a Bullet Journal, my meal planning has gotten even easier. I started out by brainstorming a list of some of my family’s favorite meals. This is going to be an ongoing list that I keep adding to as we try new recipes. Next, I created a simple Meal Planning template with a space for each day of the week, one for meal prep, and one for a shopping list. I knew I was going to use post-it notes, so I drew the boxes according to those sizes. I put this layout at the front of my Bullet Journal so it’s easy to find. I just replace the post-its every week, so I don’t have to redraw the spread until I move into a new journal! I like having the shopping list post-it available to add items to when I think of them throughout the week. Start out by deciding if there are any days you’ll be eating dinner away from home. We usually have date night on Friday, and eat leftovers one day of the week, so I put those in first. I try a couple new recipes each week, so I scan Pinterest or the recipes I’ve saved in Copy Me That (read more about this below!) I put the new recipes on days that I know I’ll have time to cook. Then I scan our favorites list and quickly fill in the other days. I also like to do some simple meal prep ahead of time to make my week easier. I usually cook some sort of protein to have on hand, cook a big pot of steel-cut oats, bake sweet potatoes, cook quinoa, make a big salad to eat from all week, and cut up veggies for snacks. Having these few staples ready to go makes a big difference in the amount of time I have to spend cooking. I look through the recipes I have planned for the week and write down anything I could possibly do ahead of time on the meal prep section of this layout. I keep a few staples on hand that I know we eat most often for breakfast and snacks. For breakfast, I usually eat oatmeal or avocado and eggs on toast. For lunch it’s usually veggies and hummus or cottage cheese, fruit and almond butter, or fruit and cheese. For lunch, I always eat leftovers if we have them. If not, I’ll eat a salad with some protein on top or occasionally a wrap of some sort. 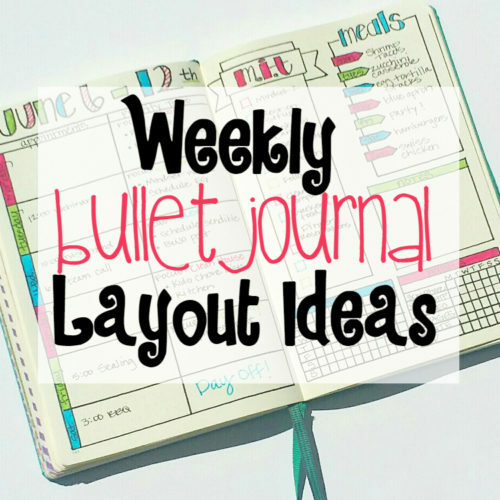 All of these things are ingredients we always have, so I don’t really have to add them to my meal plan in my Bullet Journal, but you totally could create a more detailed layout that includes the other meals. One thing I’ve found helpful is to create a master grocery list with the items you buy every week. I have that list saved in Copy me That so I always have it when I’m at the store. 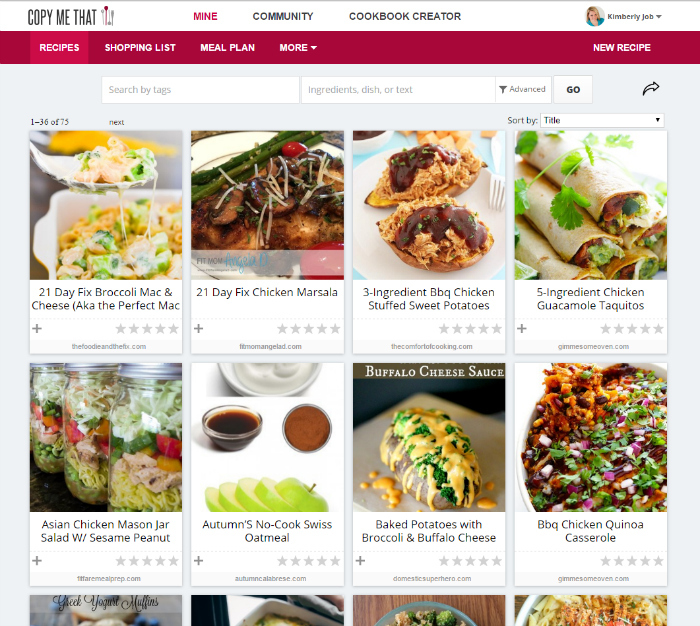 Copy Me That is an amazing FREE site that allows you to save recipes you find online. It has a similar visual style to Pinterest. There is a web clipper tool you can put in your menu bar so that anytime you find a recipe you want to save online, you just click the web clipper and it saves it to your recipes in Copy Me That. Here’s a picture of what your recipe board looks like. You’re probably wondering, why would I use that when I can just use Pinterest!? The most helpful part of Copy Me That is the shopping list function! 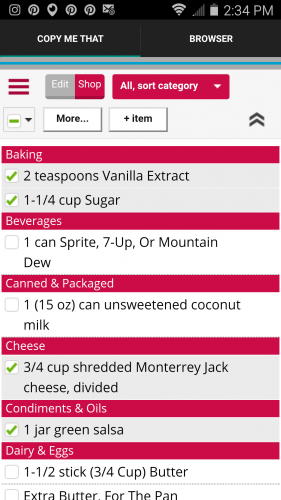 You can add all the recipes you’re making to your shopping list and it organizes them for you. You can sort your list by category or by recipe which makes shopping super organized. There’s even a phone app! Here’s a screenshot of a shopping list on my phone. You can mark off the items as you get them at the grocery store. Have one central place to save all your recipes. When brainstorming your list of family favorites, make sure to ask your family members. Never go to the grocery store without a list. You’ll spend more money and still wonder what you’re going to eat. Check your freezer and pantry to see what foods you already have on hand before you start your plan. Have a leftover night. Your kids will survive, I promise. Prep a few basic ingredients once a week. Consider rotating through only a few options for breakfast, lunch, and snacks to make planning easier. Do you have a great meal planning tip? 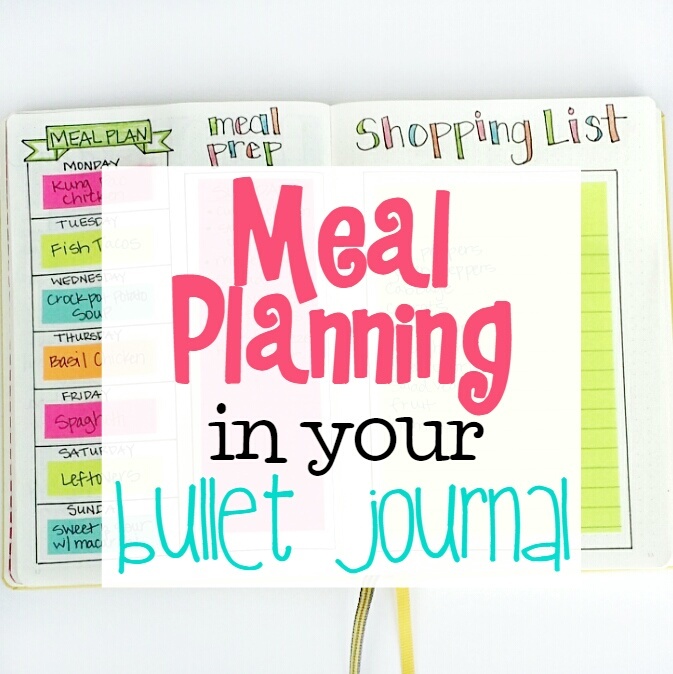 Do you use your Bullet Journal for meal planning? If you have a favorite spread, feel free to leave a link to it in the comments below. You are an inspiration. I love reading your blogs and all your great ideas. Thank you so much !!! This is a great post. 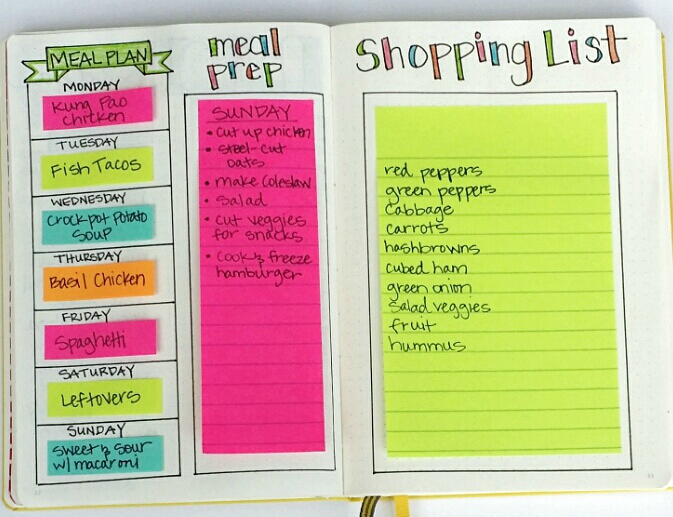 Meal planning helps save time, money, and stress! It also helps me stay on track with my weight loss. If I don’t plan, I’ll just grab whatever’s fast (and fattening!). As usual, I LOVE these ideas. I really need to get on the ball with meal planning. 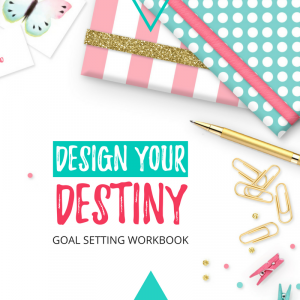 Right now my hubby is taking charge of cooking for him and the kids so I can stick to my own diet, but I think I could get a meal planning system set up and give it to him to make his life easier! Thanks so much for sharing! I’m so copying this spread into my bullet journal I love it and I’m not super creative when it comes to making spreada so thanks for the amazing idea! Brilliant!! 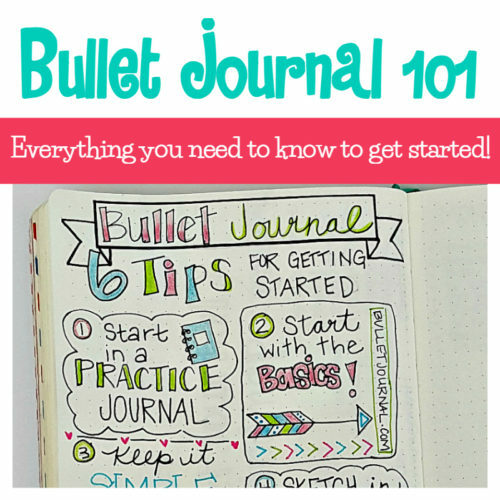 I’d wondered how I was going to do this in a bullet journal! Thank you, thank you, thank you! I have felt like meal planning is overwhelming when it’s just the two of us, but this layout and system are JUST what I needed! No more “I give up, let’s just get pizza” nights! (Ok, maybe once in awhile) Thank you for sharing your tips with me! Thanks again for all the great ideas to add to my meal planning. I try to add one or two new recipes per week just for fun, but mostly rely on things I already know my family likes. 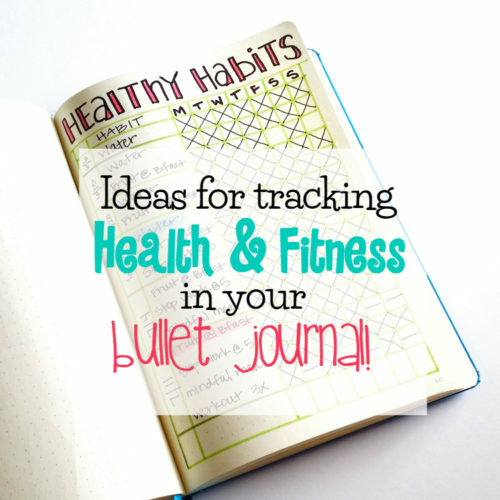 In my bullet journal, I make a page of our meals for a month at a time. 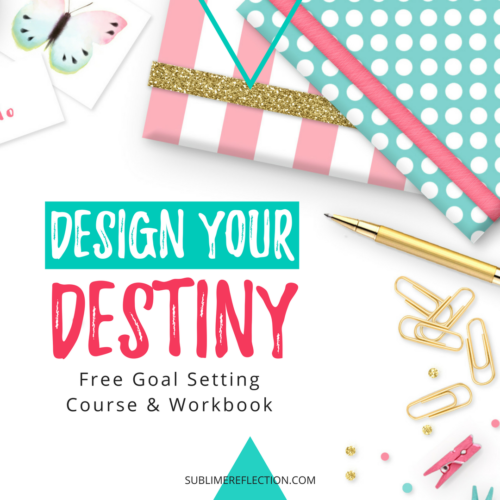 I get “decision fatigue,” (it’s a thing! ), and live only sitting down once a month for this. I look st how many dinners I’ll be responsible for, and come up with my list as well as my grocery list. Then I buy the missing ingredients that first week when shopping. What I cook when depends on using the ingredients that will last the shortest time first as well as both what I’m in the mood for and the amount of time I have. The other shopping trips include replacing milk, bread, produce, etc. as well as buying the best deals (meat for example). I also have a two page spread with columns of the stores I shop at, and as I run out of items, they get added to the appropriate column. Then I just go here when making my list, and cross them off as I buy them. This spread lasts me all year! Great idea! I’ve been thinking of doing a monthly meal plan as well. IF you did 12 of them, you could just rotate throughout the year. I had tried to do meal planning, but I did not feel motivated. I will be trying your method. I also will be searching your blog to find out about the bullet thing. 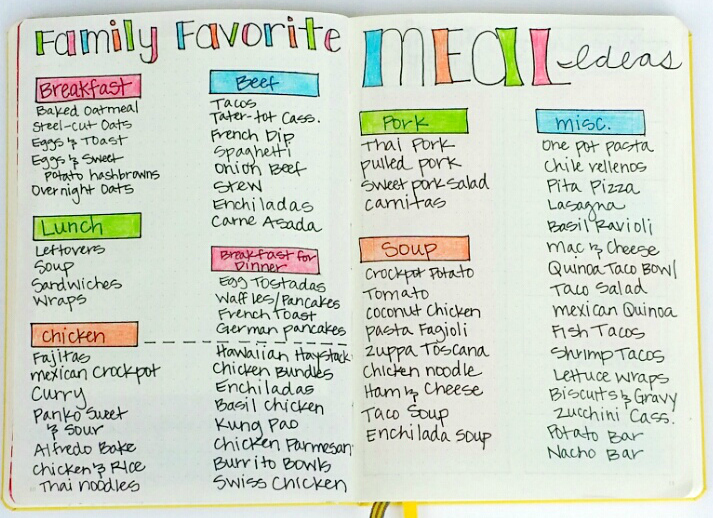 This is seriously the most genius meal planning/grocery list idea I’ve come across yet. I love it! Thanks for sharing — I’m definitely going to put my own together! Where do you find the right sized post it’s? mother of 10!!!??? wow, if I can’t learn something from you, I can’t learn!… Just found your site and hoping to be a regular. Love the meal planning for bullet journal. What size post it notes do you use, if I may ask. I use the post-it flags. What size are the post-its that you use? They are the post-it flags. Thank you so much for the information about Copy Me That!! I just signed up and started saving recipes! I absolutely love it!! I’m so glad you like it. It’s a lifsaver for me. When the week is over what do you do with the stickie notes? Toss? save? if so where?